It's almost two years since I won an iPad 2 from Sulit.com.ph's anniversary promo. And now, I'm getting excited again! Why? Because Sulit's anniversary month is fast approaching again. That means another round of giveaways! Yay! Sulit.com.ph is having a 6-week long promo called "Billy Benta’s Treasure Hunt" and the prizes at stake are: Samsung Galaxy Grand Duos, Samsung Galaxy S4, gift certificates, all-expense paid trip to Boracay and Palawan and our grand prize of P100,000! All Sulit.com.ph members who have active accounts with at least 1 active advertisement and valid member details are eligible to join. Joining is pretty simple. Just log-in to your Sulit.com.ph account (not yet a member? 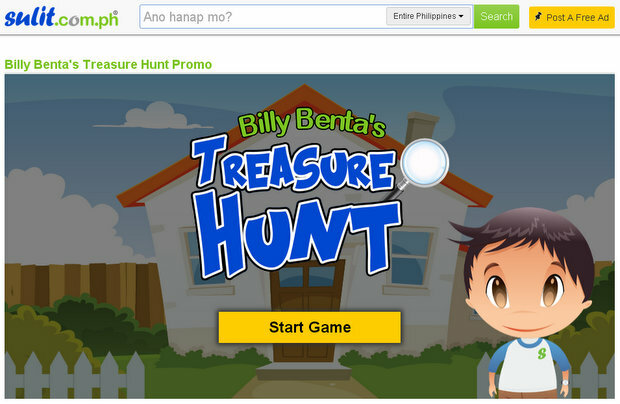 click here) and just play Billy Benta’s Treasure Hunt (see promo page) to earn raffle entries. A member can only play once per day. The game is a simple memory game to help Billy Benta sort his items that he will sell on Sulit. An item will be flashed for 3 seconds. Find and click the correct image to get points within 20 seconds. An item found = 1 point= 1 raffle entry and a maximum of 5 points = 5 raffle entries. To get 2 additional raffle entries, simply choose to share your game score on your Facebook Timeline. For the full mechanics, please read here.